Back in the 2000´s, I didn´t have Internet in my house, I fact I´m not sure Internet was a thing like now. The point is that back then my only source of anime was TV, or in reality cable TV, and one of my favorite channel´s was Fox Kids. Fox Kids, the channel that brought me and all Latin American kids animes series like Digimon, Monster Ranger, Shinzo, Beyblade, etc. And among those series was Shaman King which premiered in 2003 and soon became one of my favorite ones. The series had pretty much all that I love in an anime series, it was fun and funny, entertaining with a lovable protagonist, battles, and spirits! so many spirits! Those who know me, know that I love sports animes, but the truth is that as much as I love them, I love spiritual animes more. Is it too early to consider this one my favorite anime of the year? So much that I decided to make it my first in My Classics category? Maybe, but the fact is that there´s no anime I have enjoyed quite like this one. I mean yes there´s Shounen Maid, Super Lovers, Boku no Hero Academia –My Hero Academia– and many others, but this one, this one is special or at least it is to me. In the last few years, there´s been little to non-animes that have picked up my interest, but I have tried from time to time to look and find one that catches my attention. So… last year I was looking for such an anime when suddenly… there it was, under the same category that gifted me with Kuroko no Basket, there was an anime that made me laugh, gave me feels, excited me and left me wanting to bang the screen of my laptop until I could finally see more! The anime in question tells the story of two former volleyball rivals -that in fact only confronted each other once?- that after swearing to go against each other once again. suddenly find themselves playing on the same team; so… competing is obviously out of questions, right? -not really!-; at the begining things didn´t go smoothly for this duo but they soon discovered that they had more in common than not and that together they could be something really amazing. 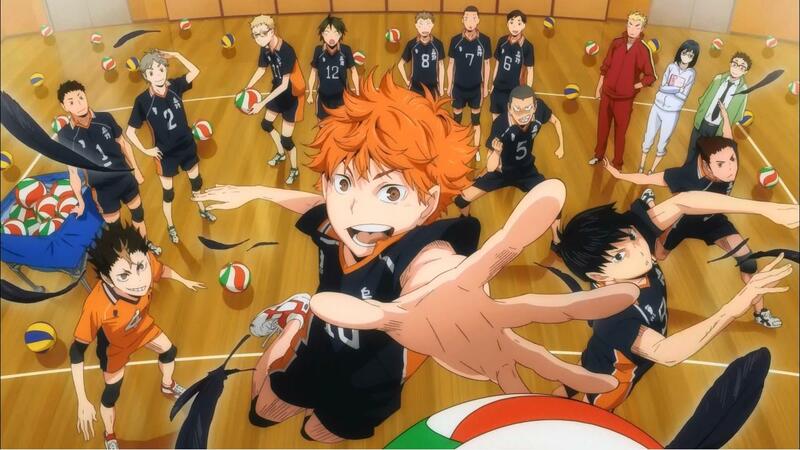 That´s basically the first episode of Haikyuu!, the first one I saw and all I needed to get hooked on it. So… I´m trying a new format for some especial cases, ´cause there are posts that I would like to share in English and Spanish, being Digimon Adventure Tri one of them. I watched Digimon for the first time when I was like 8 or 9 years old, and like anyone back them, I loved the anime. In fact my brothers and I used to watch the series everyday in FOX KIDS; we had our favorite characters -mine was always Matt/Yamato-, favorite digimons and we even pretended to be choosen kids. More than any anime back then, Digimon was something different for me, it was lessons in friendship and courage, not giving up, not blaiming yourself for your parents divorce or issues, learning not to be alone, taking care and loving your siblings and many other things. We could all relate to the choosen children one way or another, and that´s why…, it was amazing. Whe the series finished, I had conflicted feelings; on one side It was great to see the epic conclusion of this anime on the final battle against Apocalymon, but on the other one… the series that had meant so much to me had colcluded. “Un tiempo después de esto vino Digimon Adveture 02, y después Digimon Tamers, seguido de Digimon Frontier; y si bien vi todas estas series, ninguno de los animes subsecuentes fue capaz de recapturar la magia de la primera serie de Digimon -pesé a que Frontier se acercara según mi opinión-, simplemente no fue lo mismo. Así que pensé que ya había acabado con Digimon cuando… los rumores sobre Digimon Adventure Tri empezaron”. I´d be lying if I said that I didn´t have my concerns at the begining, but I tried to see it in the most positive way -specially after finding out it was a series of movies and not an anime series-, but… having seen the final results, I can gladly say that I´m happy with the results. Years ago my cable provider finally decided to include Animax in our package, that was in 2006 or 7 I believe. Then streaming anime wasn´t something I could do easily, so… I had to wait until the local channels decided to try putting more anime on air or until Animax premiered some new animes -something difficult ´cause more often than not, they repeated episodes over and over again-. Black Cat was one of the animes aired by AnimaxLA in those years along with Get Backers, The Prince of Tennis, The 12 Kingdoms, Hunter X Hunter, Bleach, Full Meta Alchemist and others. Because of its animation and characters design, Black Cat was one of the animes I followed religiously, even if the story wasn´t that good and at times left me feeling like something was missing. I went trough great lengths to make sure I didn´t miss an episode, and finally I saw the great confrontation between Train and… Eve? That´s right at the end of Black Cat Train´s big confrontation wasn´t against Creed Diskenth, but Eve the girl weapon that Sven -Train´s associate- took into his care almost at the same time as Train. So… Black Cat´s anime ended and I still felt like something was missing, so I decided to check the manga.